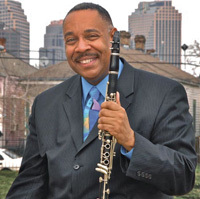 A New Orleans native, Michael White has primarily led an urban life as a Jazz musician and professor at Xavier University where he teaches African-American Music and holds the Rosa and Charles Keller Endowed Chair in the Humanities of New Orleans Music and Culture. He has also served as guest director at several Jazz at Lincoln Center concerts relating to traditional New Orleans Jazz, often working with Wynton Marsalis. White has also served as a commissioner for the New Orleans Jazz National Historical Park. 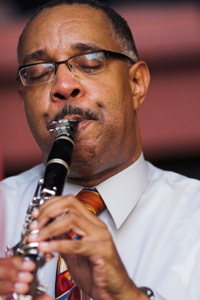 Michael began playing clarinet in classical settings and moved on to perform with brass bands, including the Fairview Baptist Church Band that was established by the noted banjoist/guitarist/author Danny Barker. His earliest contact with traditional Jazz bands was hearing veteran musicians such as clarinetist Willie Humphrey and Louis Cottrell at the New Orleans Jazz & Heritage Festival. White clearly recalls the first time he performed traditional Jazz with a “sit-down” band that took place outdoors in Jackson Square, which is located in the heart of the French Quarter. He arrived at the job to discover a 10-piece ensemble that included noted elder statesmen of the style including trombonist Louis Nelson, bassist Chester Zardis, banjoist Emanuel Sayles and trumpeter Kid Thomas. “I played Burgundy Street Blues’ for the first time in public,” White remembers with a touch of wonder remaining in his voice. “So there I was with Emanuel Sayles who was on some of the records with George Lewis playing this song.” Veteran trumpeter “Kid Sheik” Colar heard the performance from afar, found out who was blowing clarinet and soon started calling White for gigs. That put the young musician, a rarity in New Orleans style Jazz, alongside his elders and deep into the tradition. White has since acted as a link between the generations with the life-long mission of assuring the continuance of the city’s classic Jazz heritage. The clarinetist formed his own group, the Original Liberty Jazz Band, in 1981 and continues to lead that band as well as the Liberty Brass Band and the Michael White Quartet. White has gained notoriety as an informed purveyor of New Orleans traditional Jazz as a gifted musician, composer, educator and historian. Long respected in his hometown and in classic Jazz enclaves around the world, he enjoyed further recognition through his association with renowned trumpeter Wynton Marsalis. The clarinetist is heard on Marsalis’ 1989 The Majesty of the Blues (Columbia) and he also arranged the music for and performed in “A Tribute to Jelly Roll Morton” at Lincoln Center where Marsalis holds the position of artistic director. “An all-New Orleans band hadn’t done Jelly since his death ­ it was like Jelly Roll was there,” White proclaims. 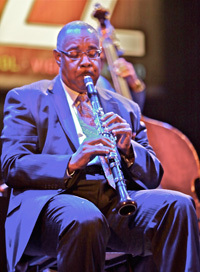 The clarinetist played Lincoln Center in a tribute to Louis Armstrong and performed at Carnegie Hall as part of the prestigious venue’s American Folk Masters series. Dr. Michael White was living in a one story home in the Gentilly district of New Orleans, near the London Avenue Canal, before the catastrophic flooding of most of New Orleans due to the Federal levee failures during Hurricane Katrina in 2005. White was a substantial collector of Jazz artifacts and history in New Orleans for 30 years, but lost nearly everything in the flooding. He had owned the original sheet music of “Dead Man Blues” by Jelly Roll Morton, a clarinet mouthpiece by Sidney Bechet, and had a collection of an estimated 5,000 records and LPs. He lost it all in the flooding. White feels that Jazz music in New Orleans will become strengthened by the experience of Katrina, that a sense of fervor has and will rise out of the catastrophe. On May 13, 2006, White performed “Just a Closer Walk With Thee” at the Tulane University commencement ceremony. Former Presidents George H. W. Bush and Bill Clinton were in attendance at the ceremony. Mr. Clinton was moved to make a remark about the performance during his speech. White has been awarded the Royal Norwegian Musical Medal of Honor by mandate of King Harald, and the title of Chevalier of Arts and Letters by the French Government. Some of Dr. Michael White’s latest CDs are “A Song for George Lewis”, “Jazz from the Soul of New Orleans”, “Dancing in the Sky” and “Blue Crescent”, on Basin Street Records.